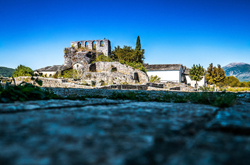 Across Ioannina there is a plethora of significant sites and imposing monuments to unfold the history and tradition of the area. 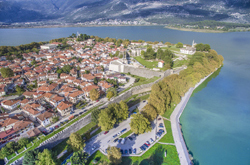 The city of Ioannina nests the Pamvotida Lake of exceptional beauty that houses a marvelous ecosystem of flora and fauna, while in the center of the lake, the inhabited Island of Ioannina is situated, adding beauty to the landscape. The picturesque island is covered by dense vegetation of pine and cypresses and is home to several monasteries, while the hamlet features traditional small houses with flowery gardens and narrow stone paved streets. At the very same room where Ali Pasha was killed nowadays is a museum with the killing bullet signs on the walls, personal belongings and documents. The Castle of Ioannina, built by Ioustinianos Emperor as a fort of the Byzantine state, was afterwards used as the administrative center of Greece during the era of Ali Pasha. The 200 acres of land embraced by the walls features several historical buildings and museums, such as the old city of Ioannina, the Aslan Pasha Mosque featuring barracks, baths and a small library, along with the Municipal Ethnographic Museum of Ioannina, Ali Pasha's Faculty of Cavalry housed in a magnificent two-storied building, the cook shops, the Voimoundos Tower build by the Byzantines rebuilt by Pasha as a serai, the Citadel with Its Cale and Kastropoliteia to include a Byzantine Museum. The region Bizani just a few kilometres off the city houses the Pavlos Vrellis Museum of Wax Effigies, to exhibit wax replicas of major figures of the Greek history. The most distinctive archaeological sites of the prefecture are located at the area of Dodoni, featuring the Ancient Theatre of Dodoni, one of the largest among Greece with sitting capacity of 18.000 people, remains of the Oracle of Dodoni, dominated by an enormous holy oak tree, along with several remaining buildings. 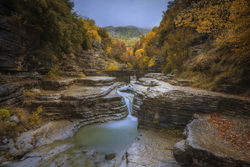 The region also counts several Folkloric Museums in Zagori, Metsovo, Tzoumerka and Konitsa as a revival of local traditions, crafts, and art. Ioannian boast a large number of monasteries and churches of unique architecture and historical importance. The Filanthropinon Monastery located in the island of Ioannina is one of the most significant monuments of the Byzantine era, as its church is a catholic wooden basilica, with arch ante-nave and three ante-chapels and it is decorated with brilliant murals. On the other hand, the Monastery of Kipina is a site of awe as it is build literally inside the rocky mountains of Tzoumerka to offer magnificent view of the gorge of River Kalaritikos, including a dome, cells, a cave and astonishing 18th century murals. Ioannina is an ideal destination for nature and extreme sports lovers. Mountains, rivers, gorges, valleys and lakes bounded with dense vegetation along with several infrastructures and facilities available in the area, guarantee unique experiences. 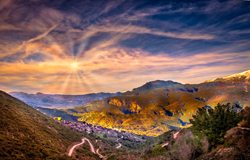 Climbers can choose between three ascensions of different degree of difficulty, while several trails are ideal for hiking and mountain biking. Parapente flyers rank Ioannina among the best destinations, while the non experienced ones have the opportunity to be fellow passengers along with skilled professionals. Rafting and kayak are thoroughly practiced at the several rivers of the area, while skiing and snowboarding at the Ski Centers of Metsovo and Profitis Ilias is the favorite sport of the area's visitors. Horse riding among the dense forests and rivers through organized riding clubs is an experience not to be forgotten. Finally the region is home to some of the most astonishing caves around the world such as Perama Cave at Perama, 1,5 million years old with marvelous stalactites and stalagmites of amazing shapes and colours, fossilized bones found in several chambers. Tzoumerka house the Cave of Anemotripa decorated with stalactites and stalagmites, small lakes and uniquely found rivers.